Crann was delighted to be involved in the Ballymun Regeneration Project. In the case of the Ballymun project, our objective was to create a feeling of ownership of the trees we planted among the entire community. We also endeavoured to ensure that the trees planted were of suitable species for an urban environment, which helped to create a pleasing landscape of mixed species which will in turn provide food and habitat for wildlife, provide cleaner air and improve the environment for everyone living in the area. In this Ballymun Project we believe that we can foster a pride among the community of “their” trees and this will have endless benefits in making Ballymun a “Great place to live”. We will measure the ongoing impact of this project by maintaining good communication links with the Ballymun Regeneration committee. 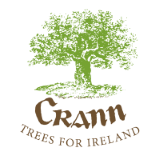 Crann feels that this type of Project has many benefits in improving the environment for those who live there and greatly assists Crann’s efforts to raise ‘public awareness’. If you are interested in helping Crann to continue with such projects JOIN US.